The N.C. Chronicles. : The last hurrah of feminism and their manginas. She's right; Feminism is on damage control. The last hurrah of the scoundrel is always to try to convince people they are not who they have claimed to be (rancid man-haters) all those years, but to switch to a lying pattern so they can regain past glory. 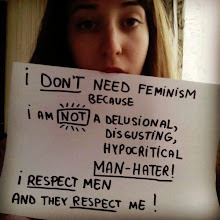 Problem is, once a group has been tagged as hater (feminism) or weak (manginas), it never goes away, specially now, where books cannot be re-written to benefit them and we have the web to read and judge for ourselves. True, something’s in the past does not fit in this society, but to have tried to change it to something worse has weakened it to a point where it is in danger of crumbling. The main target of feminism and their manginas was the total destruction of marriage, traditional families, especially fatherhood, where did that get us? More poverty, homelessness, drug abuse with kids, forgotten elderly, but the most destructive was what they went after, their concept that there is no difference between the genders. Instead of promoting the individual strengths of each, they claimed men and women are the same and as we know they are not, nature saw to it. The only similarities is, we are all of the human species, the differences between the gender is what makes us strong, it is what adds to our capabilities to deal with life, one has a different outlook than the other, we look at things in your own way...individually and on a basis of gender. That's what evolves humanity and society, not a "beehive mindset". Feminism is on its last leg, we still have the leftover of that era that will sneak in and still tells us we are all bad, but basically people have realized advancements are easier and faster when we treat each other with respect for our individual significance in the circle of life. Demonizing one over the other has produced the weakest leaders, destroyed families, kids with no long term goals and those who believe they should get it all “right now” instead of working hard for it. The hatred of that cult is front and center, their beliefs in been privileged made them so arrogant that they believe they can say anything they want, demonize anyone they see fit, destroy anyone in their path, fathers, husbands, even wives and stay-at-home-moms. We find the weakness of their character incredible and laughable, unable to realize they have become the joke and buffoons of a world that is waking up to their idiocy.